Live Painting with ELLIE PAISLEY & AARON BROOKS and Visuals by THE PSYCHEDELIC EXPRESS LIGHT SHOW. 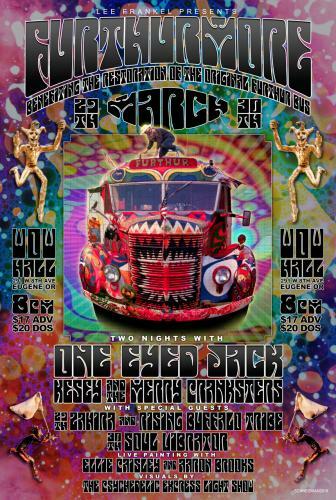 On Friday and Saturday, March 29 and 30, Lee Frankel presents FURTHURMORE featuring One Eyed Jack, Kesey & The Merry Pranksters and special guests Zahira & Rising Buffalo Tribe. For over two decades One-Eyed Jack has been entertaining crowds throughout the USA as NJ's longest running top jam band. Jack has dropped four original albums and has a fifth in the works. Formed by champion guitarist Gary Gallagher as a psychedelic garage band performing in Grateful Dead parking lots during the 90's -- though various lineup and style changes the original sound has remained. The band’s powerful psychedelic rock and roll sound mixes dual guitars with heartfelt, soulful lyrics that touch on both the spiritual and the surreal. With the arrival of guitarist/lyricist Joe Boris came brilliant songwriting described as "Dylanesque" by Relix Magazine. Once bassist/lyricist Adam Riley joined, the song repertoire doubled and the sound gained increasing power. The driving rhythm section has Vincent Smith on drums; his gift of playing goes beyond technical expertise into deeper transcendent spaces. The wild wizardry of Tim McCullion on keyboards sends the music and listener on a colorful voyage. Topping it all off, vocalist/lyricist Rosie Lazroe brings her dynamic voice and songwriting, as well as a stage presence filling with fire and lightning. As successful as their recording career has been, One-Eyed Jack are equally known for their thrilling live shows. A place to dance and "Freak Freely" has always been the atmosphere created. With a vibrating and pulsating light show set to cosmic jams and dancing souls, their psychedelic blend of rock and roll transforms the audience to higher levels of groove and consciousness. Throughout the years One-Eyed Jack has shared bills with Bob Weir, Mickey Hart, Hot Tuna, Dark Star Orchestra, Karl Denson's Tiny Universe, David Grisman, Keller Williams, Railroad Earth, Galactic, Oteil Burbridge and many more. The band has performed at such venues as Alex Grey's C.O.S.M. (NYC), B.B. King's Blues Club (NYC), The Cutting Room (NYC), The Fox Theatre (CO), Nelson Ledges Quarry Park (OH), Starland Ballroom (NJ). Zahira is a cultured renaissance woman whose pure, powerful and resonant voice has received rave reviews from fans and critics around the world. Her success as an internationally known vocalist, songwriter and musician inspires people to be strong and positive, and she faces life every day with a special energy that lights up each stage she performs on. Zahira’s original music combines elements of soul, pop, reggae, hip-hop and electronica. She can be seen performing with her solo live-electronic project and with her live band Rising Buffalo Tribe, or as a guest vocalist with Oregon reggae rootstronica group Indubious, who also featured Zahira on their track “Root Down” from their album From Zero. With a style and tone described as a blend of vocalists such as Lauryn Hill, Madonna and Erykah Badu, Zahira debuted with jazz influenced soul / reggae material and expanded into an experimental neo-soul, reggae, electronic fusion artist. She released Rise Up, her first full-length album, in 2014. Her new roots reggae single w/ pop appeal, “Mystic One” featuring Rising Buffalo Tribe, was released in 2018. Zahira studied jazz vocals and performance at Green Mountain College, and for many years has independently trained in North Indian classical vocals, sound healing, performance, dance and West African drumming. This devoted diva’s voice ranges from alto to a high soprano, and she uses it as a dynamic instrument in a rich and powerful way. Aside from her native English, she has written and performs songs in Hebrew, Sanskrit, Arabic, Spanish, French, Michif and indigenous languages to share her message with the world. Being part indigenous (Metis / Algonquin) Zahira utilizes her music to promote healing and empowerment in response to human and environmental rights. The seven-piece Rising Buffalo Tribe features heavy drum and bass, tight rhythms and a powerful horn section. Creating music with deep dubs and explosive highs, their full-bodied sound provides a universal atmosphere that reaches the essence and core of roots reggae music. Tickets are $17 advance, $20 day of show. Doors open at 7:30 pm and showtime is 8:00.